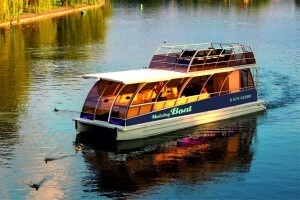 Come enjoy an entertaining and educational ride around the lakes in Trakai in a comfortable, modern, ecological boat. You get wonderful views of Trakai Island Castle, the peninsular castle complex, Užutrakis mansion, and the islands of the Galve lake. The boat can host tourist groups, individual visitors or corporate events. Kybynlar restaurant offers a full service with catering on the boat or in the restaurant Kybynlar, water-borne entertainment, organisation of events requested by passengers on the water, corporate events, and seminars. The boat has up to 33 seats, some of them outside on a sun terrace with small tables and armchairs. The boat can operate any time that the lake is free of ice and it is kept warm by its on-board heating system.